Thanksgiving is just a few days away. 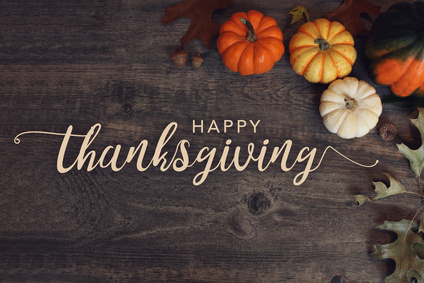 It’s a great holiday (apart from the eating too much part) because thankfulness is a beautiful thing, especially when it’s directed toward God. We should be most thankful and grateful to God for the mercy, grace, and forgiveness he has given to us through his Son, Jesus Christ (Col. 3:15). But our thankfulness shouldn’t stop there. We experience God’s kindness and compassion in a variety of ways each and every day, and sometimes it comes by his “common grace.” Common grace is just that—common. It is indiscriminate and is available to all, or at least all those within a specific sphere of influence. We experience God’s common grace in a myriad of ways, especially in the U.S. and the developed western world. In this article, I want to focus on one area in particular: stewardship. #1 – I am thankful for the abundant wisdom in the Bible on how to steward our God-given resources well. Anticipating the challenges that we would have with money and possessions, God in his wisdom and compassion saw fit to include a lot of teaching about them in the Bible. In fact, there are more than 2,000 references to them in the Scripture (about 800 are about money in particular). Money is not a central feature in most of the Old Testament narratives; most references are found in the covenantal laws established by God for the Israelites. But we also see God’s abundant provision for his people and concern for the poor along with his judgment of fraud and abuse, especially in the warnings and judgments by the Prophets regarding the social injustices imposed on the poor by the wealthy at the time. But the New Testament has much to say about money, both in the Gospels and the Epistles. Usually, through the use of parables, Jesus had more to say about money than he did hell! He stressed the priority of the spiritual over the material (and, similarly, the eternal over the temporal – see Luke 12:13-21), but without suggesting that the material is somehow wrong or evil in itself, as well as sacrificial generosity toward the poor. He also taught a parable on wise investing (Matt. 5:14-30). We see this in action in the Book of Acts in the ways that the early church and its members were a model of sacrificially giving, living, and sharing with each other. A life of diligent work as a means of God’s provision, combined with generosity and sacrificial giving, is then further taught by Paul in his epistles. #2 – I am thankful that most churches put a significant focus on the practice of godly stewardship in general and generosity in particular. Ever since the time of Christ and the early church, virtually all well-known church leaders have addressed money and the Christian life. Some of it touches on the modern-day concept of “stewardship.” The focus has always been on moderation, self-denial, and charity while condemning excess, waste, and treating money as our personal possession to do with as we wish. The church fathers challenged all believers to put their money to good and godly use, motivated by love of God and neighbor, and avoiding greed at all costs. More recently, the “stewardship principle” has taken hold in many Bible-believing churches. It teaches that God owns everything because he created everything, and since he created and redeemed us to be a part of his church on the earth and his eternal kingdom, we are called to be his stewards. It also teaches that our money is given to us as a tool to be used for the spread of God’s kingdom on the earth. Because our lives belong to Him, everything we have is also his and is to be used for his glory. This leads to a life of wise money management, generosity, and sacrificial giving. We learn to hold what God has given to us loosely, using what we must to provide for ourselves and our families while being generous with the rest. All that we possess—our time, talents, and treasure—are to be used for God’s ordained purposes and his honor and glory in the world. #3 – I am thankful for the wise authors and teachers in the Body of Christ who have helped us to understand apply biblical principles to our finances. The modern church has been blessed to have many godly men who have modeled and taught the broader Body of Christ about kind of stewardship described in #2 above. I don’t think it would be an exaggeration to say that millions have been positively impacted by their ministries. First, there is Randy Alcorn who runs Eternal Perspectives Ministries, which is focused on “investing in what lasts for eternity, and helping others do the same.” Alcorn’s books, especially Money, Possessions and Eternity and The Treasure Principle, have encouraged Christians to be more eternity-minded in how they manage the resources that God has given them, investing in eternity and not just the temporal needs and wants of this life. Then there is the late Larry Burkett, whom many consider the “father of Christian Personal Finance.” Burkett founded Christian Financial Concepts in the 1970s, which merged with Howard Dayton’s Crown Ministries in 2000 to become Crown Financial Ministries. Larry authored many books, including How to Manage Your Money and Debt Free Living. Howard Dayton led Crown Ministries until 2009 when he started a new ministry called Compass-Finances God’s Way. Dayton has also authored several books, most notably Your Money Map and Your Money Counts. Crown Financial Ministries is now led by Chuck Bentley. Interestingly, Dave Ramsey credits Larry Burkett’s teachings with helping him get out of debt and forming what eventually became FPU. Both Crown and FPU start with establishing a small emergency fund and progress toward the ultimate goal of being free to save and give because you have a spending plan in place and are free of unnecessary and harmful debt. Dave’s focus is on a sequential set of “baby steps,” which is similar to Crown’s “Money Map.” Dave emphasizes completing each step before moving to the next, whereas the Money Map is more flexible and allows for some steps to be worked on simultaneously. Two other authors who have served the Church in this area for a long time are Austin Pryor (author of Sound Mind Investing and owner of the Sound Mind Investing website and newsletter service) and Ron Blue (author of Master Your Money and Your Money After the Big 50, among others). Both are professional investment advisors (Ron Blue founded Kingdom Advisors, a professional training and support community for Christian financial advisors) and take a distinctly Christian approach to investing. In addition to Compass, Crown, and FPU, several new authors/teachers have shown up on the scene who have helped and encouraged many. Jaime Munson wrote Money: God or Gift, John Cortines and Gregory Baumer authored God and Money, and Art Rainer recently published The Money Challenge and Marriage Challenge. (Art also maintains a great blog on Christian personal finance and leadership.) Well-known author and teacher Paul David Tripp even got in on the act with his recent title, Redeeming Money, which deals with money and the heart. With so many excellent resources, we can be adequately equipped with both biblical wisdom and practical methods to wisely steward all God has given us. #4 – I am thankful for the many tools that are available to us to help us manage our finances well. Owing mostly to technology advances, we now have lots of tools to help us better manage our finances. These include computer software and online (“cloud-based”) services such as Quicken, You Need a Budget (YNAB), Mvelopes, Intuit’s Mint, and Banktivity (for the Mac). These tools can help you with daily money management (budgeting, bill payment, and expense tracking). Most include both free and paid options based on your specific needs. There are also services that help with long-range planning and meeting your financial goals, such as Personal Capital, FutureAdvisor, and On-Trajectory. These help with investment portfolio planning and management and provide “dashboards” that show you how you are progressing toward your financial goals. #5 – I am thankful for the number and variety of investment choices we have to grow and protect the money that God has given us to manage. There is a seemingly endless number of investment options available to the average investor. These include individual stocks and bonds, mutual funds, exchange-traded funds (ETFs), etc. Consequently, we have more options than ever before. Unfortunately, they aren’t all good options; in fact, many should be avoided. But on the other hand, many are very good and suitable for investors based on their goals, risk tolerance, age, and degree of knowledge and sophistication. If you want to invest in utility companies, there are individual stocks, bonds, mutual funds, and ETFs for that. If you’re going to invest in gold mining companies, you can find that too. You can be ultra-safe (federally-insured bank accounts or US Treasury bonds and funds) or ultra-risky (small-cap emerging market company stocks, bonds, or funds). Insurance companies offer a variety of annuity products, some of which are highly complex and costly, but others are simpler and less costly and may make sense for many investors. #6 – I am thankful for lower investment costs and fees across the board. The cost of investing in the things I alluded to in #5 above is less than ever before. And this is a bigger deal than you might realize. Twenty or more years ago, current fund fees would have been unimaginable. The cost-pendulum has swung pretty far. According to a study by Morningstar, in 2017, the average expense ratio of about 25,000 U.S. mutual funds and ETFs was .52%. (Compare that to 3 or 4 percent from just ten or twenty years ago.) According to Morningstar, this meant an annual savings of over $4 billion in fund fees as investors have increasingly purchased lower cost funds. Competition between low-cost providers like Vanguard, Fidelity, and Schwab continues to drive fees lower. I own a Schwab stock dividend fund (SCHD) that has an expense ratio of just .07%. Moreover, Fidelity Investments recently announced four ZERO EXPENSE index mutual funds! Clearly, things have come a long way when it comes to the cost of investing. We can buy many funds for almost no fee (and a few for no fee), and we can also trade for next to nothing as well. Fidelity and Schwab charge only $4.95 per trade and $0 if you buy one of their funds. Plus, we have better access to information on our investments than ever before, right at our fingertips. So, compared to just 10 years ago, it’s a great time to be an investor. It has never been cheaper or easier. Everyone, regardless of how much money they have to invest, has access to a large number of low-cost alternatives and the tools to help make them successful. This is indeed God’s common grace to us. #7 – I am thankful for the new automated investing services that technology has made available to all investors. If I used the term “robo-advisors” 10 or 15 years ago, you would have given me a puzzled look. That’s because, for all practical purposes, they didn’t exist. But now, in 2018, there are over 100 such services. A robo-advisor is a type of financial adviser that provides investing advice and management based on mathematical rules or algorithms. Such calculations are performed by software and do not require a human advisor—they automatically allocate, manage, and optimize clients’ assets. The key factors are convenience, ease of use, low cost, and features like automatic portfolio rebalancing and tax-loss harvesting. Investors who want to be hands-off and don’t want (or need) a relationship with a human advisor due to having a relatively non-complex financial situation, may benefit from the use of a robo-advisor. Many younger or first-time investors, especially those who are internet-savvy, may find these services attractive. Robo-advisor-only firms Betterment, Wealthfront, and Wealthsimple are the leaders in this space. However, most larger investment managers like Fidelity, Vanguard, and Schwab, and banking firms like Wells Fargo and Ally, now offer these services as well. #8 – I am thankful for the short and long-term benefits provided by tax-advantaged retirement savings accounts such as 401(k)s, 403(b)s, and IRAs. Most people will supplement their income from Social Security (and perhaps a pension or annuity) with income from a retirement savings account. These accounts, whether they are used in an employer-sponsored retirement plan such as a 401(k) and 403(b), or a personal plan such as an Individual Retirement Account (IRA), allow our savings to grow without having to be reduced each year by taxes paid on either 1) the capital gains, or 2) dividend or interest income. These tax advantages enhance the compounding effect as it leaves more money in our accounts to grow over long periods of time. In the face of the decline of employer defined benefit plans (pensions), IRAs were established as part of the Employee Retirement Income Security Act of 1974 and employer plans like 401(k) and 403(b) were enacted by Congress by the Revenue Act of 1978. Since that time, Americans have been able to save for retirement while getting assistance from their employers through matching contributions and from the government through tax-deferral (and in the case of Roth accounts, tax avoidance). Under these plans, your contributions, any employer match, and any earnings (including interest, dividends, and capital gains) are all tax-deferred. The ability to retain the money in the account that would otherwise have gone to pay taxes becomes a potent force in maximizing the growth of our investments. #9 – I am thankful for the financial services profession, especially fee-only financial planners and advisors who adhere to the “fiduciary rule” in how they offer advice to clients. The Bible stresses the need for wise counsel (Prov. 11:14; 12:15; 19:20). This includes how to best steward the resources God has given us. There are mainly 2 kinds of financial advisors: commission-based and fee-based (and some are a combination of both). Advisors who work on commission may have an inherent conflict of interest when it comes to making investment recommendations, but those who work for a fee (either a “fee for service” or a “percentage of assets under management”) are more likely to adhere to the “fiduciary rule,” which requires them to always act in the best interest of their clients. #10 – Finally, I am grateful for God’s love and his promise to meet our daily needs—in, through, and because of his Son, Jesus Christ. But if God so clothes the grass of the field, which today is alive and tomorrow is thrown into the oven, will he not much more clothe you, O you of little faith? Therefore do not be anxious, saying, ‘What shall we eat?’ or ‘What shall we drink?’ or ‘What shall we wear?’ For the Gentiles seek after all these things, and your heavenly Father knows that you need them all. But seek first the kingdom of God and his righteousness, and all these things will be added to you (Matt. 6:30-33 ESV). And my God will supply every need of yours according to his riches in glory in Christ Jesus (Phil. 4:19 ESV). If we don’t wisely manage the resources God has entrusted to us, God will not forsake us because his faithfulness to his promises is not always based on what we do or do not do. However, that doesn’t mean that the way or the manner in which he provides for us will be as we might have hoped or planned. In the end, we have to trust in his wisdom and sovereignty in all things, including our daily bread.